If you are looking for fun and addictive games to play on the go, then you should look no further than Megableu! We have put together a list of travel board games only for you. Trickin’ Camel will keep you alert, Break Out will have you planning strategies, and Name That will have you thinking. These games for travelling will make children have the most entertaining trip! Is the Trickin’ Camel going to trick you? 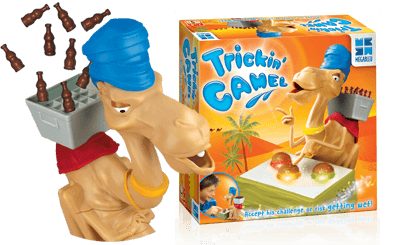 One of the best travel games for kids is definitely the Trickin’ Camel. You are wandering in the desert alone and lost. But there is still hope because a camel appears carrying drinks. The camel challenges you to win the drinks. However, beware because the camel can trick you and it might throw the drinks. Collect as many as you can to be the winner! 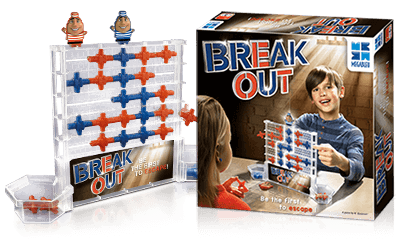 A great game to take with you on holiday, that will certainly keep the kids entertained. Suitable for 1 to 4 players, 5 years old and up. Who will Break Out first? Do you have the best strategy to help your prisoner escape? When it is your turn, take the rope of your chosen colour and put it in one of the 10 horizontal slits to the left or right. Create a line that reaches your prisoner who sits on top of the wall. Be the first to help him break out and win! Be the smartest in Name That! 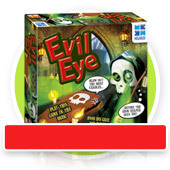 Finally, you wouldn’t miss the king of the travel board games! Everyone loves Name That! For 2 or more players over 6 years old, it is the car game you will always have with you! How quick can you find the answers? Take a card from the pile and read the category. 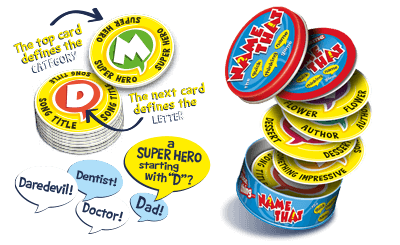 Then find an answer that begins with the letter shown in the next card. Be faster than your co-players to win the card. Whoever collects the most cards at the end of the game wins.